It was crafted by knitters from all 50 states, four Canadian provinces and Ireland who donated 3-foot-by-3-foot swatches of knitted yarn. 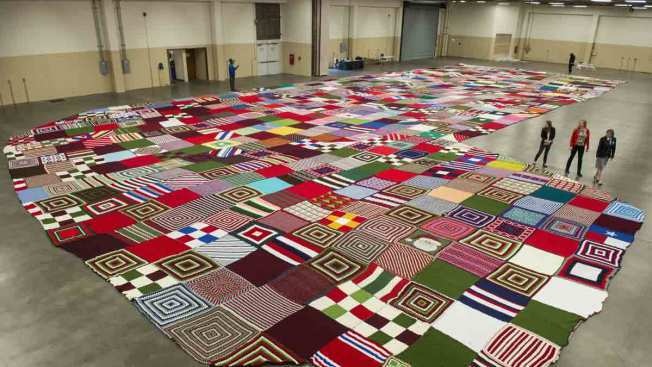 A knit stocking, the world's largest, according to the Guinness Book of World Records, covers the floor Monday, Dec.7, 2015, at the Crown Expo Center in Fayetteville. Santa may need more reindeer to haul the gifts required to fill what's been designated as the world's largest Christmas stocking. The Fayetteville Observer reports that the 1,600-pound, 7,700-square-foot stocking will be unveiled at Arnette Park in Fayetteville on Saturday. Kimberly Patrick, an adjudicator for Guinness World Records, says the stocking was measured by a local land surveying company and qualifies as the largest. The stocking was created with yarn from Caron United. The Washington, North Carolina-based company donated part of the proceeds from yarn sales to provide more than $100,000 for scholarships for the children of U.S. military members who have died.